Just A Car Geek: 1961 Audi German Army Jeep - $132.00? 1961 Audi German Army Jeep - $132.00? If you look in the comments section of today's post about the GAZ-21 Volga, you'll see a post from Andre. Andre runs a website called ladausa.net. I love his website because it's simple, well laid out and dedicated to a car that most people in the USA have ever heard of, let alone own and collect. He also has a forum dedicated to the cars, which he calls the Lada International Forum. The name says it all and the forum gets posts from all over the world. Lada owners seem to be a great bunch of people as you see very little of the "My car rules, yours is sh*t" type of posts that you see on so many other automobile forums. These guys help each other out, post pictures, interesting stories, opinions, etc., and generally respect each other. Many, many other car forums could take some tips from this one. Anyway, I hadn't visited the site or forum in a few weeks and seeing Andre's comment reminded me that I should do so. In the forum, in the section titled "Parts/Cars For Sale/Wanted Ads", was a post titled "Check this out. Doubt the price is right." That's where I found this vehicle. The price listed is $149.00 Canadian, which comes out to around $132.00 US. That might be a typo, but it may not be as this vehicle needs extensive work. The work it needs is a little out of my league (that's not true, it's a lot out of my league), but it would sure be a cool vehicle for someone with the time and talent to take on. 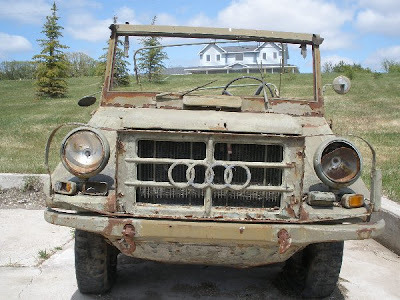 Located in Brandon, Manitoba, Canada, click here to see the listing for this 1961 Audi military vehicle. Wow, that is one hell of a project!!! Still imagine the interest you would get with it all fixed up, would create a lot of attention at a Willys Jeep meet! The Audi looks like it was buried underground for awhile! I agree with Richard, that would be a great car to bring to an offorad event. It would most likely cost a small fortune to restore. The lada site is great. Thanks for the link. I see your blog this is nice. you want a best audi Used Parts please visit our site.